I went out for a bite to eat on my first day in Chisanau. I then decided to go and see what all the hub-bub across the street was all about. I kept hearing a loudspeaker and people cheering. By the time I got there the cheering had stopped. But, there was still a number of people left in the area. 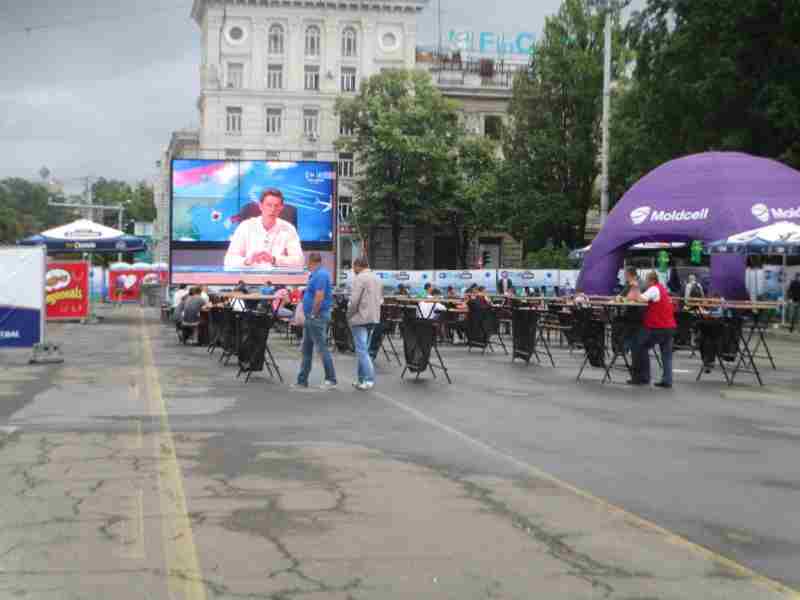 It seemed that there were two big screen TVs (really, really big screens) each at one end of the area. There were lots of tables. There were plenty of beer stands. There were people selling food. There was a bandstand with a band. Since my Romanian and my Russian are not quite what they should be I’m going to have to guess at what I was seeing. In my opinion these people were football fans and they were watching football. Only, when I walked through there were no games going on at the time. Still, there were dozens of people sitting around the area. I’m sure that there was seating for several hundred and several hundred more could have stood around. 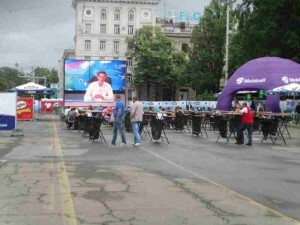 The big sponsors were Moldcell, a cellular company and Chisinau beer, the local brand of beer. This is some serious football watching, especially considering that Moldova has no dog in the fight.